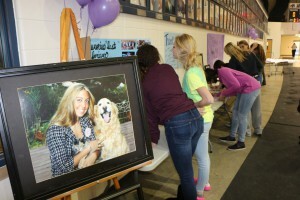 Tuesday’s Heather’s Voice night at Perry Meridian High School raised money for a scholarship in the name of former PMHS basketball player, Heather Norris. Norris was killed in 2007 a victim of domestic violence. Her former team leaves an empty chair for Heather at the end of their bench during home games. 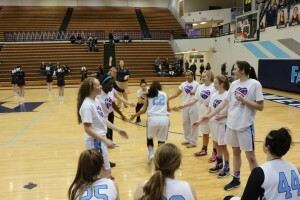 Both the Perry Meridian and Center Grove basketball teams wore Heather’s Voice shirts during warm up. 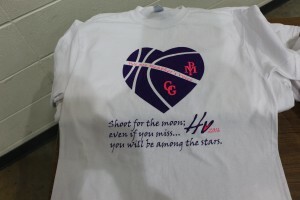 Several items were part of a silent auction fundraiser throughout the girls basketball games. That auction continues through Wednesday’s boys basketball game. Some 12-hundred dollars was raised Tuesday night not including auction items. To see those items up for bid log onto the Perry Township Schools Facebook page.